St. Mary’s graduates, Carlie Mathews (B.A. 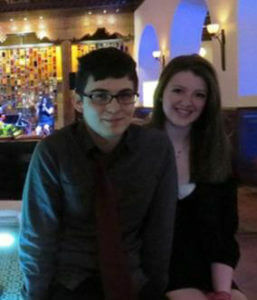 ’14) and Charles Lopez (B.A. ’14) have been accepted to the Japanese Exchange Teaching (JET) Program, which aims at promoting ties between Japan and other countries by hiring native English speakers from all over the world to assist public school teachers in Japan. Inspired three years ago by their Japanese language professor at St .Mary’s, Professor Balite, both students learned about the program and found themselves intrigued by the idea of teaching abroad. Last year, both students took another Japanese language class and were able to travel to Japan for twelve days, confirming their desire to educate students half way around the world. “During our trip, we were able to speak with students studying English. These conversations really made me want to apply for the JET program and teach,” said Lopez. Mathews attributes the discovery of her job to St. Mary’s and individuals who inspired her along the way. “Before studying at St. Mary’s, I had no idea what I wanted to do. The faculty and resources at St. Mary’s University helped me figure out what I wanted to do post-graduation and gave me the confidence to achieve it,” said Mathews. Both students leave the U.S. for Japan in July, and will be a part of the JET Assistant Language Teachers (ALTs) program, providing language instruction in Japanese schools.